A new little boy is coming into this world! (As of this post he is here! And is amazing! But this post was written back before he was born so let's go back in time.) 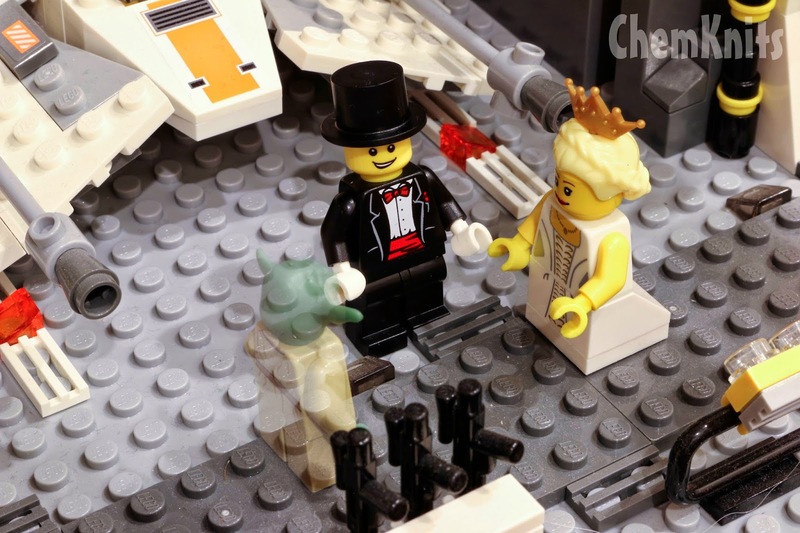 His parents are huge star war lovers, which is part of the reason Keith and I created a Lego Star Wars Wedding Photoshoot for them last year. Ghost Yoda! Check out the rest of this wedding adventure! The mother-to-be grew up a husband and is like a sister to us. I crocheted a panda hat for her new little one as soon as I found out she was pregnant. As I'm writing this post, I am in the process of planning her baby shower and want to give her something I know she wants. When she showed me some adorable pictures of babies in crochet yoda hats I knew I wanted to make her one for her shower. In the end I selected Tory Feyko's Yoda Hat Crochet Pattern. I am always nervous when I purchase a pattern that has very few Ravelry projects, but I've crocheted enough baby hats at this point that I should have a reasonable feel for the sizing. Wish me luck! I had some KnitPicks Wool of the Andes worsted weight yarn in Avocado which seemed like the perfect color, but thinking back to the yardage consumption of other baby hats and the rather large Yoda ears I was concerned that there wouldn't be enough yarn. I really wish the pattern had yardage information! This is the reason I take the time to weigh my yarn before and after projects so I can help others know if they'll have enough yarn. I ordered two more balls from KnitPicks. If I can't finish this project for a 3 month old baby in 150 g of wool then there are bigger issues here! I'm starting with the yarn I purchased versus the yarn in my stash so I can try to keep this all in one dyelot if I can. The stash yarn can always go into the hat ties if needed. "I sometimes add additional rounds of SC at the end if I misjudged the gauge/size of the hat until it gets to the desired size." - This sentence sums up my problems with this pattern. It seems like the real benefit is for the yoda ears, but I also really liked the multiple SC rounds at the bottom of the hat! I wish that some measurements were provided here, I'm really bad at gauging how to place ear flaps with the height of a hat. After one SC round the hat measures 5.25" from the crown and 7" wide. (Hey, I'm on target for my measured hats that fit Lucky around 8 weeks!) I decided to add 2 more SC rounds (3 total) before starting the earflaps for a measurement of just over 5.5". Ultimately, the hat being a little large for Blue Harvest's Halloween is better than a little too small, right? When it came to the earflaps themselves, the instructions were a little loosely written. Sizes were designated for Toddler and Adult (and I'm assuming baby) without designation for the sizes that fall in each category. Eek! This is driving me crazy. I turned to Repeat Crafter Me and used her owl earflap hat pattern to figure out how big to make the flaps. 48 sts is between the 3-6 and 6-12 sizes so I used 10 sts (SC) to start the first earflap. I followed the yoda hat instructions to make the flap itself. For earflap #2, I counted 16 sts across the front of the hat and attached the yarn to create a second 10 sc earflap. (12 sts are between the earflaps ont he back of the head.) I did 1 sc round around the entire hat. 18 g remain from the first ball of yarn (30 g consumed). Wahoo! The base hat looks super cute. I want to wait to do the ties after I've finsihed the ears so I can help balance the hat. I wanted to use a smaller hook for the ears to make them stiffer. I would have used a 4.5 mm hook if I had one with me, but since I was using my move-in-progress kit I only had a G hook to use. I think it will work great. Especially since there is only one size of ears given for the pattern, I don't want these ears to totally swamp the baby! After row 8 of the first ear, I'm wondering if I should have used HDC's to make it longer. If I'm not happy with the final length that this is exactly what I'll do for a second earflap. Why did I think this might take 3 balls of yarn? Oh right, there was no yardage information with the pattern and the other projects on ravelry used a lot of yarn. Of course, they could have been making hats for older children, but I had no way of knowing. This is why I take the time to weigh my yarn before and after projects. Not only will this information help myself if I want to make a pattern again, but it can also help others. I was really happy with the scale of the ear. Phew! I didn't want to have to redo it! I did a sc border around the ear but skipped the slip stitch edge and fastened off at the ear tip. I'll be able to hide this I think. I finished both ears and I was still on the first ball of yarn. I could finish two hats with the amount of yarn I have here! Whoops, so much for busting up my stash! I was a little nervous about how to fold the ears. I think folded over at the top, a wrinkle in the middle and then sewed on slightly curved is the answer. As I was stitching it together to practice, I actually gathered the base rather than curving it so it would be easier to stitch on to the hat. Final Measurements: 5.5" crown to brim, Just under 7" wide (13-14 inches around). The hat and ears without ties used 46 g of yarn. With the ties I used a total of 55 g (121 yards) of yarn. This little boy is going to look so cute! I cannot wait to see him in the hat. And the costumes of the rest of the family. Lucky has an R2D2 sweatshirt, maybe he can join in the photo.